From the 9th century through to the 16th century, the population of Albert like many other villages and towns in the Picardy region, dug into the chalky soil underneath their homes to build tunnels and hideouts, called "Muches" to take cover from any Normand or Spanish invasions which frequently occurred during that period. During the First World War, the town of Albert became a British garnison town. The 1st of July 1916 offensive began from Albert. In 1918, during the ultimate Ludendorff offensive, the only way to retrieve the town for the British army was to destroy it completely. The Post Office was the only building left standing. Then came the « reconstruction phase » and the construction of new industries. In 1922, Henry POTEZ created his aircraft factory which became a European first in 1936. It then became part of AIRBUS industries, now called STELIA. At the approach of World War II, which everyone felt soon upon them, to shelter the civil population and prevent mass exodus, the Town Hall decided to fortify the underground tunnels. 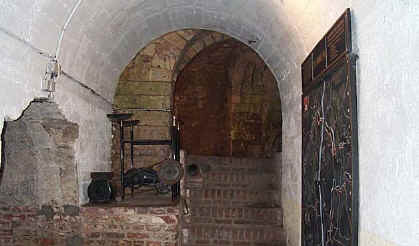 It is inside the largest tunnel (10 meters underground and 250 meters long, from the Basilica through to the public garden) in which the Somme 1916 Museum is located. The long corridor and alcoves allow for real life scenarios to show the life of soldiers in the trenches. By the end of 1991, under the leadership of the Municipality, the idea of creating a museum honouring 1914-1918 war veterans takes shape. Thierry Gourlin (who was head of the Albert Fire Station at the time) and a team set up a reconstruction project along with 11 people from an unemployment reinsertion organism, working during 6 months to repair and retrofit the already existing tunnel. The museum opened its doors on the 1st of July 1992, that year 10,000 entries were registered. That number had reached 90 000 by 2014, 60% of the visitors being Anglophone. Each year, the museum obtains new relics to valorize the scenes during the winter closure. "Lord, do for Lahire now what Lahire would do for you do if you were in his place and if he was in yours." 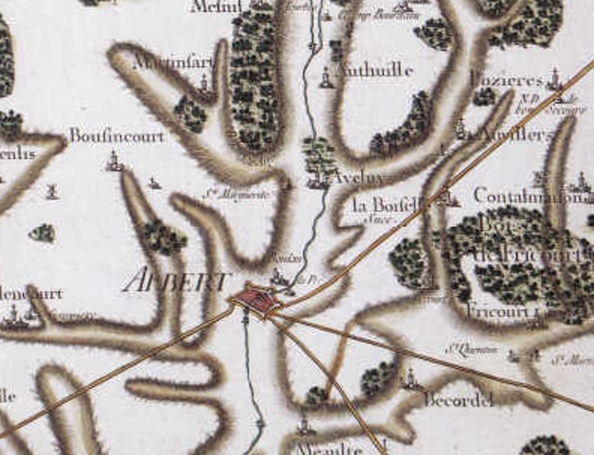 Originally called ENK, the city of ALBERT was also known to our ancestors as ENCRE and ANCRE until 1620, when patent letters from Louis XIII decreed that it would be named ALBERT after Lord ALBERT OF LUYNES. Being a Roman Station as from 54 BC, ENCRE was part of the second Belgium for five centuries under Roman rule. Having become property of the Kings of France, the land of ENCRE went from the hands of DAGOBERT, to the abbots of CENTRULE (Saint Riquier) whose lords of ENCRE were without doubt liegemen. Taken over again by Hugues CAPET, it successively fell into the hands of CAMPDAVESNES, HUMIERS, CONCINI, LUYNES, BOURBONS. Citizen Philippe Egalité would have been the last Lord. 35 000 Anglo-Dutchmen under the orders of Count BUREN, invaded Picardy, took and burnt ENCRE where only ruins were left. ENCRE is once again destroyed by fire by Imperials. The few houses making up the city were once again prey to flames and the Imperials destroyed its fortifications. The 18 000 horsemen of Jean de WERTH, PICCOLOMINI and of Thomas de SAVOIE looted, burnt and massacred areas of the Somme, ALBERT is invaded and burnt. 1500 Spanish horsemen along with 3 canons return to burn Albert once again. CONDE of behalf of the enemy brought despair to our Northern border, by taking ALBERT, exposing it to looting and reduced to ashes. ALBERT is occupied by the coalition army and notably by Cossacks. With the restoration is the Second Empire, the prosperity of the city is grows steadily. The iron industry takes shape. During the war, the town occupied by the Germans is subject to many submissions. Its uses the motto « VIS MEA FERRUM » to which can be translated to: “my strength is within the Iron”. At the beginning of the century, its population rises from 2000 inhabitants to 7343 in 1911. The 29th of August, the Germans enter Albert. The Commander takes hold of the Town Hall, the Armes Square and takes the mayor as hostage as well as 52 other citizens. On the 15th of September, the Front is stabilized and German troops take position at the gates of the town. ALBERT is exposed to continuing horrors of bombing. The British offensive takes place on the 1st of July 1916. It’s the Franco-British offensive. During enemy withdrawal, on the 21st of March, the town accounts for 40 civil victims. 28kilometres from the front artillery bombings, successive air raids took place killing 15 victims who were not combatants. March 25th, Germans reoccupy ALBERT to which the British, our allies, take back over on the 22nd of August. All that was left was “Nothing remained but name, glory and the ruins”. The 18th of September, ALBERT is cited in the Order of the Army. The War Cross takes its place with the Coat of Arms of the commune. With the energy of its inhabitants "Martyr City" will rise from its ruins, more beautiful and flourishing with 8400 inhabitants in 1931. Today, ALBERT counts 10400habitants.